A Case study published in « Case Studies in Engineering Failures Analysis » of october 2015. Failure of a cracked steering wheel is studied in this paper. Steering wheel, mounted on a speed boat, had cracks emanating from one of the fastener holes until final fracture occurred.Possible causes of crack occurrence include excessive fastener torque moment, fretting between fastener and hole combined with poor machining that left marks that serve as potential crack initiation points. 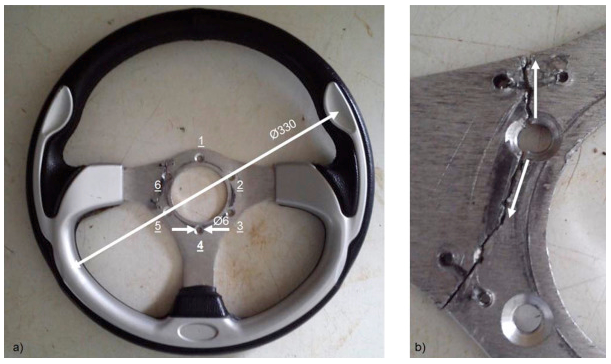 Obtained results are valuable for predicting fracture behavior of the cracked steering wheel and can be taken as a reference for design and exploitation process of such component. Ce contenu a été publié dans Publications par geraldb17, et marqué avec analyse de défaillances, brittle fracture, cas concrets, case study, fastener, rupture brutale, steering wheel. Mettez-le en favori avec son permalien.